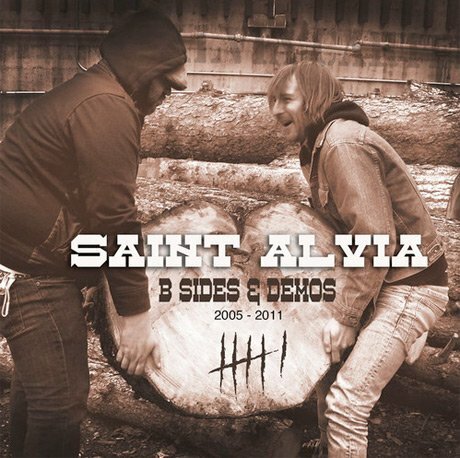 Burlington, ON punk unit Saint Alvia may be saying goodbye this Saturday (December 7) at the Burly Calling fest, but they're giving fans a parting gift ahead of the farewell performance via a rarities set called B-Sides and Demos. The 14-song collection, which you can stream and/or download down below, includes a number of unreleased tracks, demos and alternate versions of tunes, handily gathered in one place. Some of newly unearthed tracks include the whistle-heavy, oozing-organ power-pop number "Kids," crunched-up anthem "The Ghost of Earl Papineau" and the punnily titled "Whogazi." You also get a cover of Neil Young's "Thrasher," demos of tracks like Static Psalms's "Not Our World" and a discofied remix of "Don't Wanna Wait Forever." "While some are great and others are rough, they were all a part of the process of growing and writing as a band," Saint Alvia said in a statement. You can check it all out and make that call for yourself by giving the tracks a spin down below. Saint Alvia's final hurrah takes place at Burlington's Boston Manner venue and finds the band supported by the Creepshow, the Dirty Nil, Organ Thieves and more.